Our ultimate guide to Miranda Priestly’s devilish style. 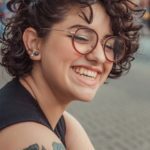 In this new post of the Bad Girl Inspiration series, which has featured the likes of Regina George from Mean Girls and Cheryl Blossom from Riverdale thus far, we shall for now move away from the Queen Bs of high school dramas and comedies. Today, we’re looking at the woman who could strike fear into all of them with a single icy glare. That woman is no other than the fearsome and stylish Miranda Priestly, from the classic chick flick, The Devil Wears Prada. 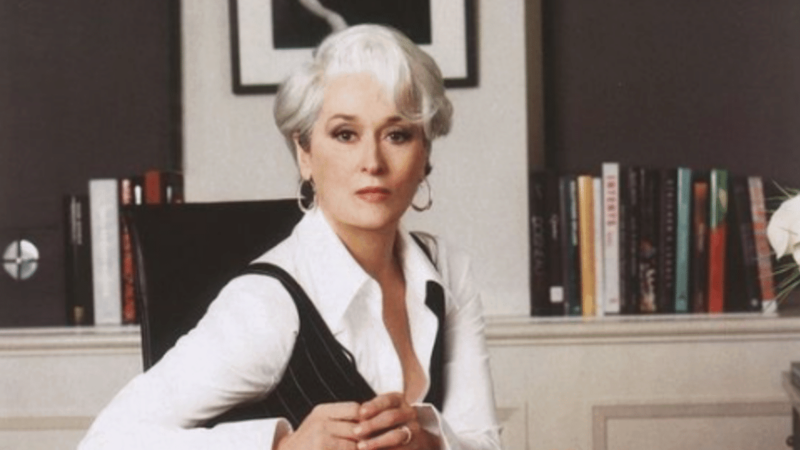 Indeed, it’s time for our Miranda Priestly style guide. In case you haven’t seen the film, Miranda is the Editor in Chief of the major fashion magazine around (and she’s, ahem, definitely not based on any famous Editors-in-Chief you’d know). She spends most of her time making the lives of her assistants, including Anne Hathaway’s character Andy, miserable with her over the top demands and icy death stare. But though Miranda might have the personality of an evil queen from a fairy tale, there is so much that can be admired about the stone cold editrix. She is hard working and serious; she loves her family and would do anything for her daughters; she understands the creative and business sides of the fashion world; and also, she is one of the best dressed women to ever grace the silver screen. 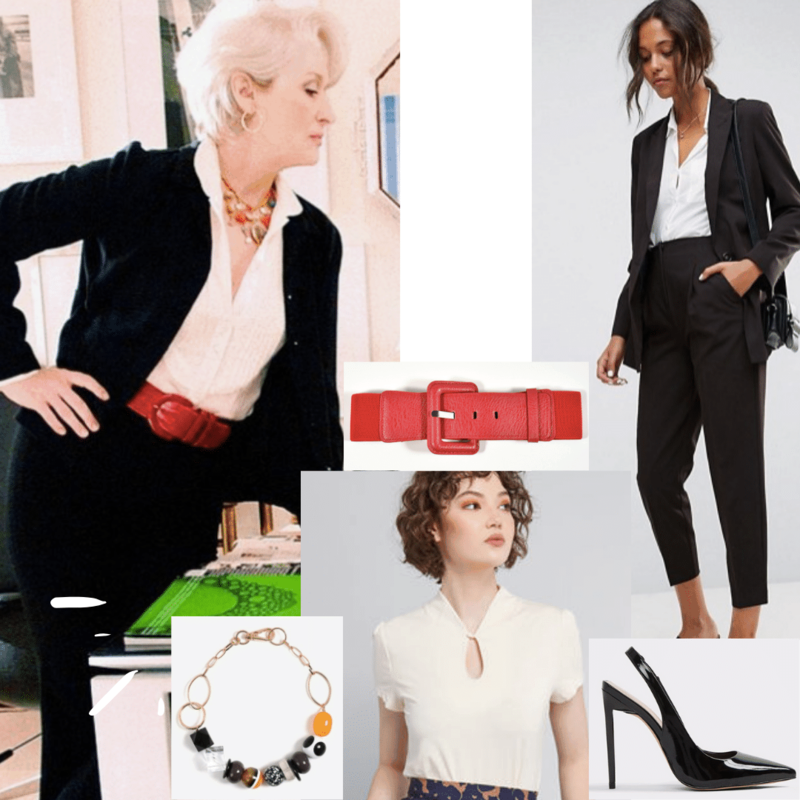 Miranda Priestly’s style is the perfect fashion inspiration for those in need of creative, but appropriate, looks to wear to work. Miranda strikes the perfect balance between serious businesswoman and influential artist. With the following three looks, you can be inspired to not only dress like an iconic bad girl, but also like a business queen. The first thing to know about the infamous Miranda Priestly is that above all else, she is a businesswoman through and through. Miranda’s wardrobe is full of classic business pieces such as slacks and blazers, but as she is the head of Runway Magazine, she does allow herself to stand out by throwing on fun accessories. The look above is the perfect representation of Miranda’s business side, as she is wearing a classic black pantsuit set with a classic white top underneath. Though in theory this starts as a boring look, Miranda naturally steps it up. She adds a red belt and chunky beaded necklace for tons of personality and style points. When copying this look, go for a classic pantsuit combo and throw on some over-the-top accessories to make you look like a badass girlboss. Though one might say most of Miranda Priestly’s outfits throughout the film are very serious in nature, she does have a few more adventurous looks in the mix. 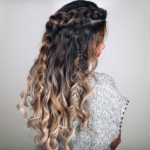 One such example is a brown monochromatic look that features a trendy leopard print top, which is an early 2000s trend that has been popping up in stores today. Walk in Miranda’s footsteps to come up with a head-to-toe brown look that will make you the fashion queen of your workplace. 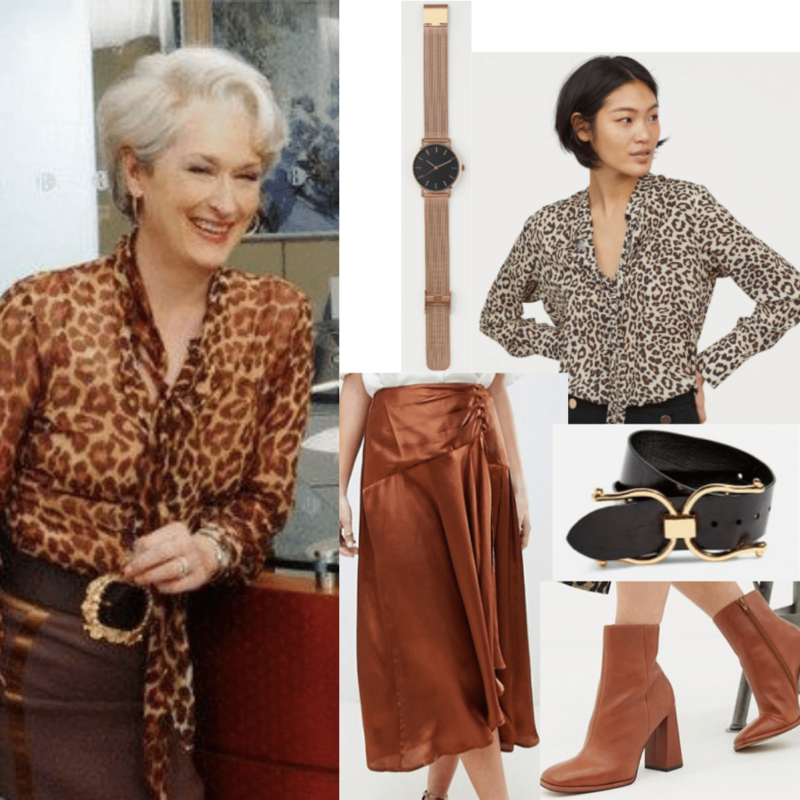 All you need to do is find the perfect leopard print top — or even a dress might work — then find brown pieces that complement the brown tones of the leopard print pattern. The first time we see Miranda in the film, she’s walking through her office building, with her employees moving out of her way so she can stride as if she were a queen in her castle. This is one of the most iconic scenes of the entire film, and is what establishes Miranda as one of the fiercest villains in film history. In this scene, Miranda wears a dark purple pencil dress and one of her classic fur coats. Her appearance is certainly a combination of Cruella de Vil and the Evil Queen. To copy Miranda’s stylish look from this scene, keep it simple by pairing a plain pencil dress with a black coat. 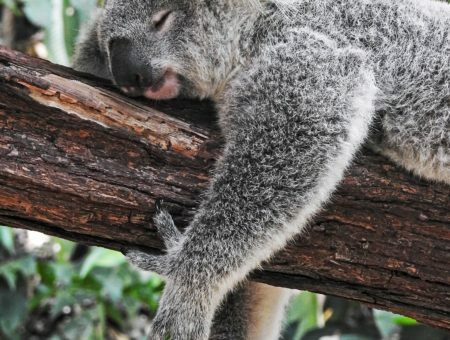 The coat could be a full faux fur one or just have a fur trim. If desired, you can also pair the look with some classic black stilettos and a pair of faux fur trimmed gloves. What do you think of our Miranda Priestly style guide? Next time you get dressed for work, think of how Miranda would dress. If you look to her for fashion inspiration, and follow the looks provided above, you are sure to be the most feared and loved person of your workplace, which doesn’t sound so bad, does it?